This special utility hardware kit includes a special bracket for mounting it quickly to the various T-Tracks on your Mk V.
Fit it to the top of your Mark 7 or Mark V's rip fence or the T-Slots in your work table surface (Mark 7 and Mark V Models 505, 510 and 520 only). 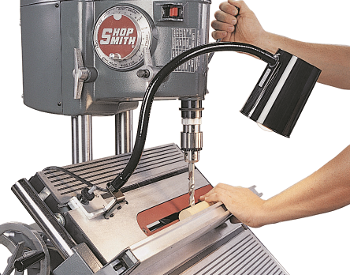 Can also be used with later model Shopsmith bandsaws and bandsaw fences, and the Shopsmith router table kit. Just slide the bracket into position and lock with a quick twist to hold and aim your accessory exactly where you need it.